I loved this book from the first page as it spoke with such a love and familiarity about one of my favorite places in the world, New York City. For Internal Use Only warmed my heart to again see the obvious affection someone else has for this one of a kind city. The descriptions started off very rich and remained so throughout the entire reading experience and oh what a wonderful experience it was. I truly feel like this author described the city so realistically that I could almost feel like I was there. The main character is so hilarious from the get go with her somewhat odd and self deprecating yet assured inner monologue that I wanted to devour the book in one sitting and I tried my best to! Her dialogue is neurotic yet ambitious and so completely like the space in my own head at times that I really loved how the character was conceived. 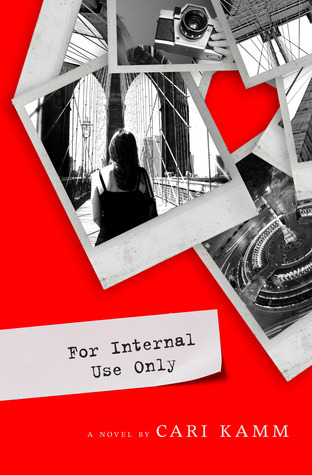 The unexpected love story in For Internal Use Only was utterly gripping and had me smiling, reliving moments in my own past that I felt were similar in their serendipitous ways. But there was also the dark side to the twisted sort of infatuation/obsession going on that I also unfortunately have experienced in my life which frustrated me but was so realistically written that again I didn't want to put down this book. From Cari Kamm's descriptions of photography, which I know nothing about, to the explanations of mundane activity, she shows herself to be a master of the written word and is truly someone I am very pleased to have discovered. For Internal Use Only was a rollercoaster ride of emotions and descriptions, quickly paced and unforgettable from every nuance and turn to the surprising end. Definitely will be one of my year's picks! Thank you to Cari Kamm for our review copy. All opinions are our own.